Natural & organic wellbeing. No parabens, synthetic colours or fragrances. No animal testing. Cruelty-Free International. No GMO. Vegetarian Society Approved. 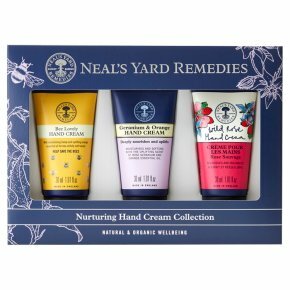 Nurture and delicately scent your hands with this natural and organic trio, made with essential oils to suit every mood - uplifting orange in Bee Lovely, calming patchouli in Wild Rose and balancing geranium in Geranium & Orange.